Government Agencies, Military, Police, Border Patrol, Customs Offices and more. What are Government Office Signs? Government offices such as National Defence Organizations, Local and State or Provincial Police Departments, Border Agencies and Public Health offices all need a certain level or representation when it comes to signage. The office signs at these offices need to be clean, and presentable with a high quality of finishing in order to convey a certain level of trust and dependability that the public has come to expect from organizations representing and taking care of the general public. Every Government office sign is unique. Whether you need custom letters or custom seal or emblem signage we will guide you through the process of bringing your custom sign to life to positively impact the presentation of your office and organization. Highly intricate backlit or lighted government office signs are possible thanks to our proprietary production methods, innovative finishes and wide variety of materials. Government signs range from simple to very complex or intricate. We approach each logo sign individually and discuss details and specifications with you to ensure you know exactly what the finished product will look like. Government office signs get right to the point. 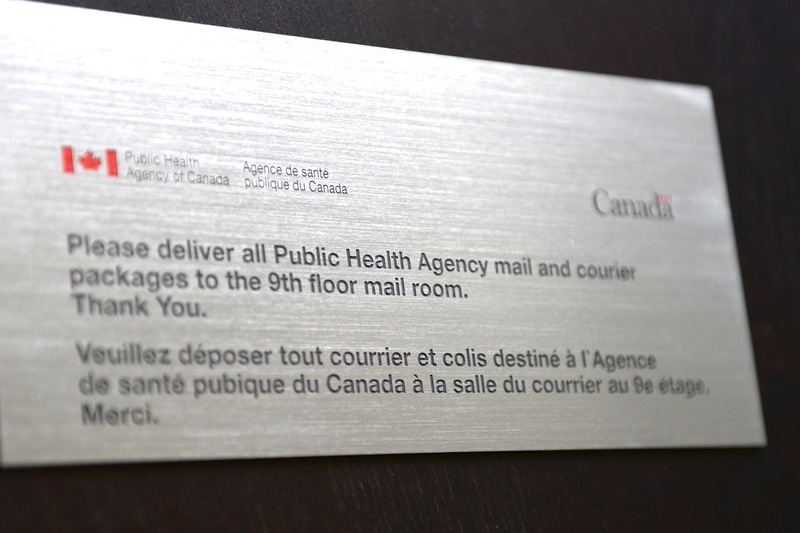 This metal plate sign for mail and courier packages is a smaller example yet it’s crisp, refined and maintains the level of clarity, focus and prestige you would expect from a government agency. 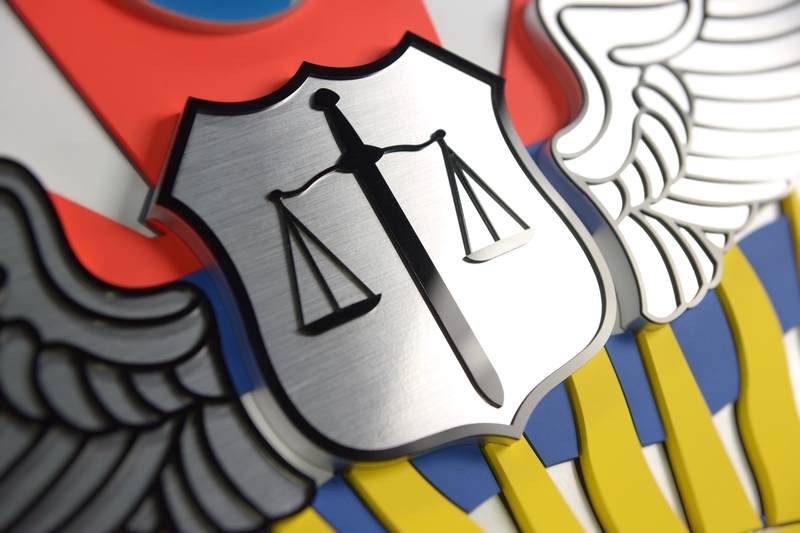 We can achieve a high level of detail when making even small reproductions of official crests and badges. Here, an example of the Royal Canadian Mounted Police (RCMP) Heraldic badge or Logo. The sides of the symbol are carefully painted to match the faces to give the government sign a seamless 3D look. Official Government Badges and Insignia contain a number of symbols, including animals, mythic figures, mottos, leaves, scrolls, ribbons, intricate names of various forces (sometimes in latin), crowns, crests, and representations of resources and arms. We approach each design element thoughtfully and provide strategic and creative resources to guide you through preparing the logo for reproduction. 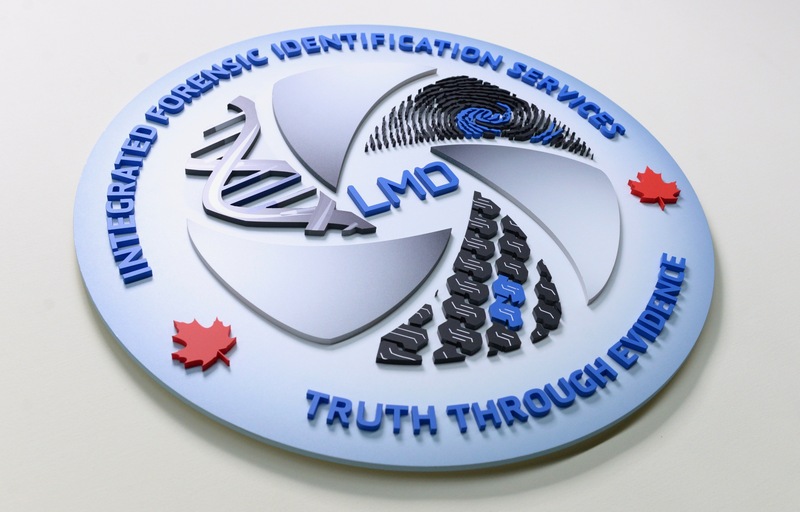 Thanks to proprietary production techniques and state of the art CNC machining, each element of your government identity can be effectively represented through 3D signage. Do you provide design services for government office signs? Yes, we provide extensive consultation, planning and design services to ensure all government signs are produced to the highest standards. If you have an internal design team, our designers will also work with your team to discuss file formats and requirements to ensure highest quality results are maintained. Do you accept PO’s for government office signs? Only in certain instances where government regulation require goods or services be received before payment is made will we consider accepting a PO for a project. A proper vetting process is required.